A Powerful sports bike from Hero which is a complete makeover of its most successful sports segment bike Karizma. Its sporty look makes it highly attractive, especially among youth. 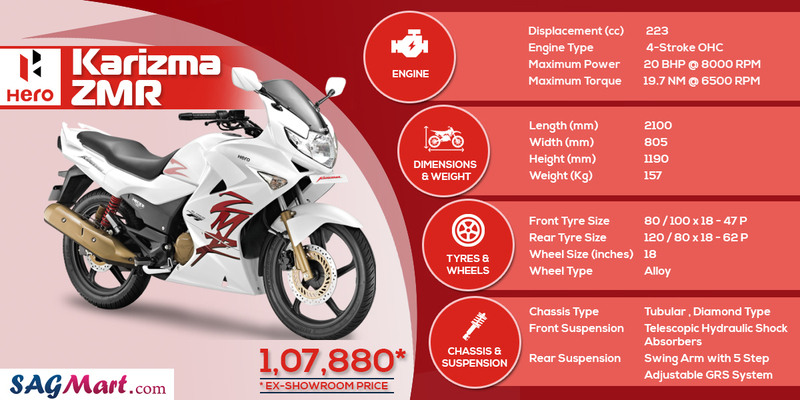 Karizma ZMR has the new feel and finishes with modification in power and performance. The flagship motorbike of Hero MotoCorp has so much of the potential. It has wisely taken the punch of Karizma to the next level of excitement. Below points will make things more clear. Karizma ZMR has so many good things, but its new look didn't match with everyone's choice. Some more points on the same will make it clearer. Hero Karizma ZMR is a good example to the most fuel efficient high performance Indian bikes. It has returned upto 40 KMPL mileage despite of having a big engine. Following points will guide more on this. Handling of Karizma ZMR is on the brighter side. Since its introduction in year 2009, the handling and riding of this bike have always been challenging for its rivals. All these dynamics were inherited in this bike from its predecessor Karizma R. The reliable Honda engine clears out the remaining doubts. It's a fun to ride bike but it would be better if Hero guys would have designed it to rest over a rear monoshock suspension to add some more enthusiasm. Hero has never compromised with the safety of this bike. The disc brakes and diamond type frame are meant to provide safest ride experience. ZMR's safety features are listed in the following stack. Being based on a sportsbike platform, the maintenance has always been an issue. As, the company sources the engines from Honda, there is less requirement of maintenance ton this because of one of the most reliable technologies. Regular checkups and settings will do everything fine on this bike. The bike won't let the rider worry about anything except mileage, and it is also a fact that people riding Karizma don't bother about the efficiency.